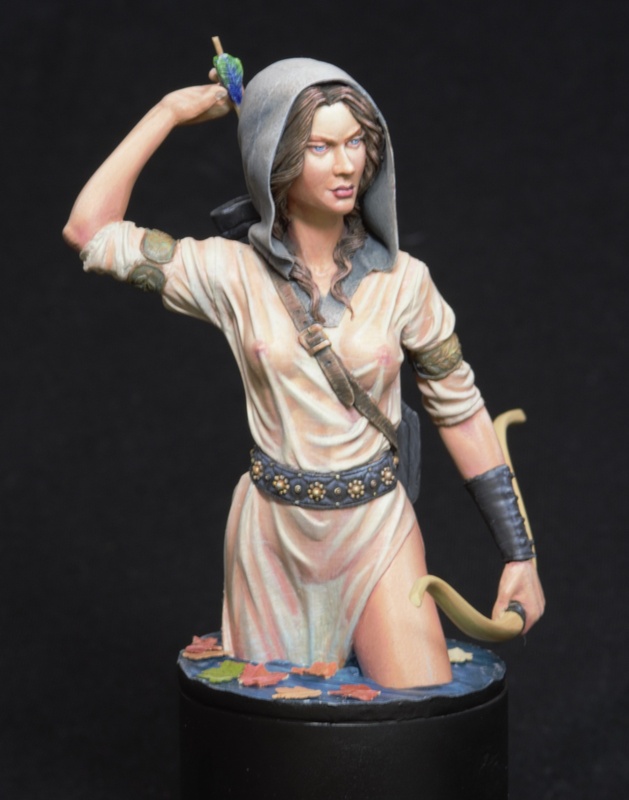 Archer from Altores Studio sculpted by Alexander Deryabin. Painted as an exercise in depicting cloth and leather textures and sheer/translucent drapery and attempting to follow other published examples of the bust (e.g. version from Marina 'Ringil' Aynagoz). Basing was cast from clear styrene resin from a 3D printed model of water ripples distorted to fit the figure. Special thanks to David Colwell for photography taken during the Crystal Dragon show in Australia. The effect of transparency is well done, it is a beautiful painting. Thank you very much Bran! It was a lot of fun to paint and attempt to combine techniques for cloth texture with sheerness. Excellent performance of wet transparent fabric! My congratulations! Thank-you Alexander for your kind words! I’m particularly happy that you like it. It’s a great sculpt which I knew I wanted to paint as soon as I saw it. Aside from the classical wet drapery which is always cool I like the pose and attitude, and the drama of the single arrow left in the quiver. To me she looks very still yet focused as if trying to nock her arrow and take a shot without alerting or taking her eyes off her quarry (or foe?). Great fun and very rewarding to paint.